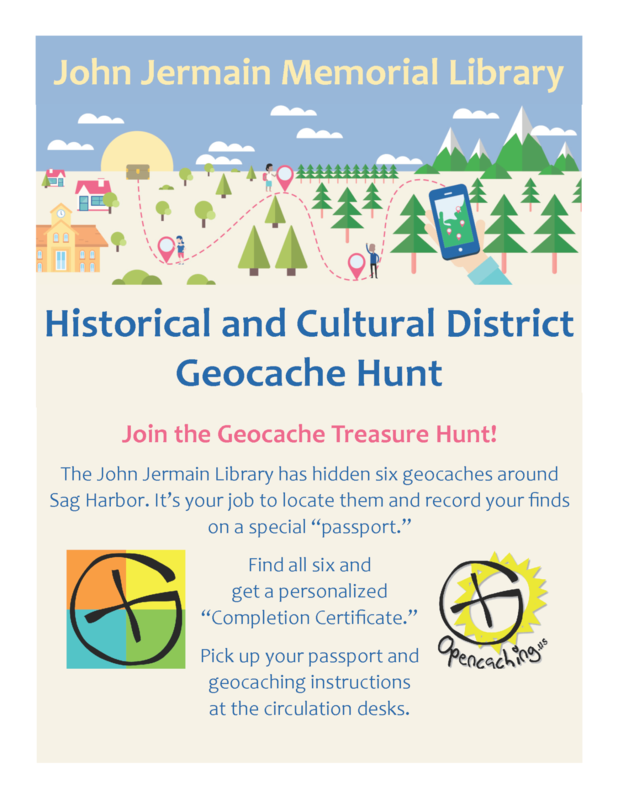 The Sag Harbor Historic and Cultural District Geocache Hunt is now fully operational again. During our move back to 201 Main Street, a couple of our geocaches went AWOL, and with all the work to get settled into our new digs, we didn’t have time to get the program up and running again. But now it it’s back. All six caches are refurbished and ready for you to find. Find all six, and you’ll get a personalized completion certificate. Stop into the library for a special “passport” on which you can record your finds, and an instruction sheet that has all the information you’ll need to get going. For those of you who don’t know what geocaching is, we’ve included an explanation below. The library’s geocaches are registered on http://opencaching.us You must create a free account at this site in order to download the coordinates of the geocaches and play our game. Due to some technical issues, only two of our six caches are listed on the popular geocaching.com website. But dont’ worry, opencaching.us is fully functional, and the only way to find all our caches. Geocaching is a real-world, outdoor treasure hunting game using GPS-enabled devices [e.g., smartphones]. Participants use an app on their phones to navigate to a specific set of GPS coordinates and attempt to find the geocache (container) hidden at that location. Our hunt adds an additional twist. Six geocaches are hidden around Sag Harbor. Each one relates to a member organization of the Sag Harbor Cultural District, all of which have cultural or historic significance for Sag Harbor. (We’re not telling which organizations. It’s part of your job to figure that out.) To join in the hunt, stop into the library and pick up a free “passport.” Then go hunt for the geocaches. Each cache contains a unique rubber stamp. Use the stamp on your passport…then go find another cache. When you’ve found all six caches, bring your passport back to the library and you will receive a certificate of completion. As mentioned above, all of the geocaches are registered on the geocaching website: http://opencaching.us. This site is a treasure-trove of information on how geocaching works. You’ll need to register in order to get access to the information about our geocaches that is stored there, but both registration, and the app for your smartphone that will lead you to the caches, are free. You’ll find a list of geocaching apps that work with various types of smartphones below. If you don’t own a smartphone but want to play, the library has two dedicated GPS navigation devices that it will loan to library card holders. Confused? Help is also available from Eric Cohen, Kathleen Comber or Mireille Stürmann at the library. Call 631-725-0049 or send an email to jjlib@johnjermain.org.